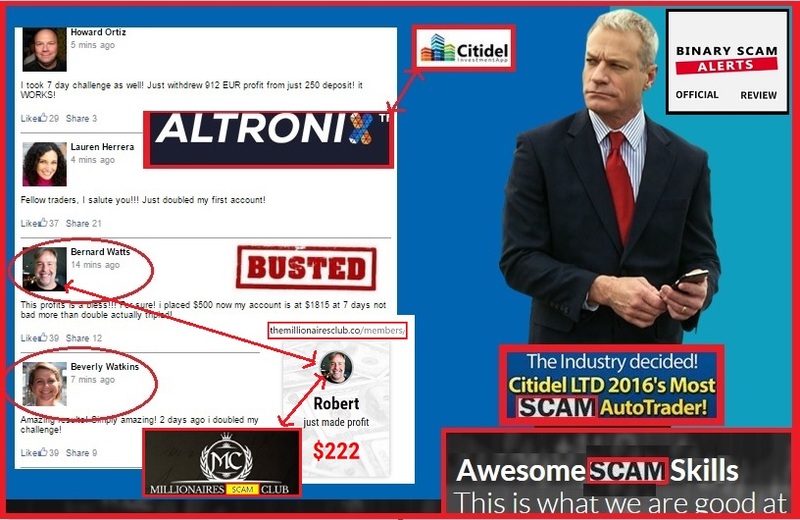 Binary Scam Alerts is Posting a Severe SCAM Notice in Regards to The Millionaires Club Software, App, and Autotrader, as well as Richard Brown the fake bearded actor. Our staff is currently receiving very aggressive SPAM E-mails with affiliate links leading to what is an obvious sham, deception, and dangerous piece of code. Once again, our staff has received threats and warnings telling us to back off, but this is not an option for us since we constantly seek the truth and base our findings on a foundation of solid evidence after taking a very methodical approach with our investigative techniques. Well, there are a few layers of proof but here are the obvious ones. 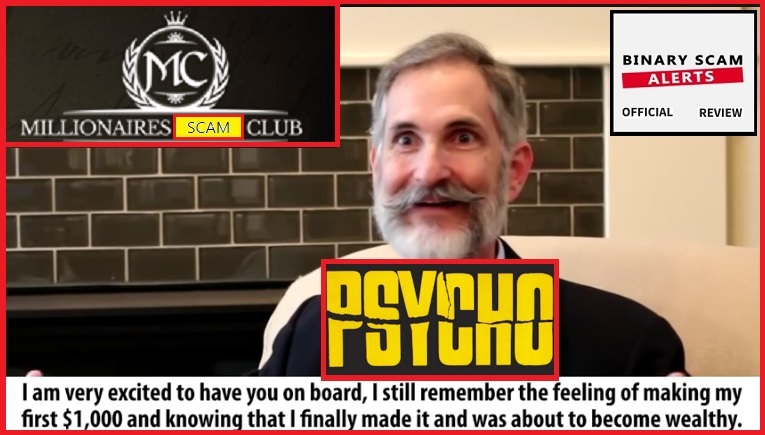 First of all, this psychopath or whoever he is reminds me of Jack Nicholson from The Shining, I do believe he belongs in a mental institution and chances are that’s where they picked this guy up from. He is anything but trustworthy and and one of the scariest actors I have seen. Secondly, the use of inflated bank accounts is used profusely and is a cheap attempt to push a sub-standard product in an already saturated market. The use of image bank actors is also very evident and can be seen in the review section below. Finally, this is the same software used by the other trash systems like Amissio Formula, Drexel Code, Trianasoft, Citidel, and Centument. This is the classic “pick & roll” type of scam where they say there is a “secret algorithm” that makes millions of dollars and has “nothing to do with MLM, Forex, or Binary Options”. That is a flat out lie, this whole thing is around trading and they even display a doctored thank you letter with the title “your binary system”. If you lie you might as well do it right and remain consistent with your story instead of contradicting yourself. Naturally, the same babble about being able to afford a lavish lifestyle and expensive family vacations is a recurring motif. The software is the same system used by about 50 more turd apps selling you the exact same trash code on a different day. To top it all off we noticed they are using some social app that gives them random image bank photos. But the images are so rehashed that you have “Robert” and “Bernard Watts” showing for the Citidel LTD app as well as Altronix. Come on scammers, you can do better than this. So in reality, you can trade 60 seconds, Ladder, High Low, or One Touch – it doesn’t matter because you will lose and all the technical analysis, momentum trading, scalping, and candlesticks charts will not help you achieve a ~90% ITM win ratio. You need to revise your thought process immediately and get yourself out of this predicament in a fast and clean fashion with whatever money you have left. Yes of course, they make sure to say this about 15 times, but you still have to invest at least $250 to use the software. These include but are not restricted to Centument, Virtual Income, Insured Profits with Dave and Ginny, the Sydney System, TSI System Scam, My First Online Payday, Trade X Confidential, Limitless Profits, Millionaire’s Blueprint,Trade Tracker Pro, Binary Matrix Pro, The Free Money System with Walter Green, Binary App 810, TrianaSoft, the Amissio Formula, Tauribot, Citidel, and the Push Money App. We are always getting new stuff in, and there is always an expectation that something new will actually work and allow you to profit. In reality they are mostly scams designed to solicit money from unsuspecting day traders. 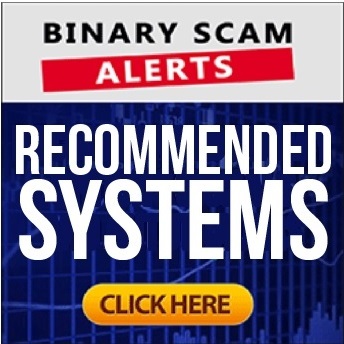 Still, if you are looking for a good signals tool you should try the Binary Profit Method. For a good Autotrader please refer to our recommended automated trading section. 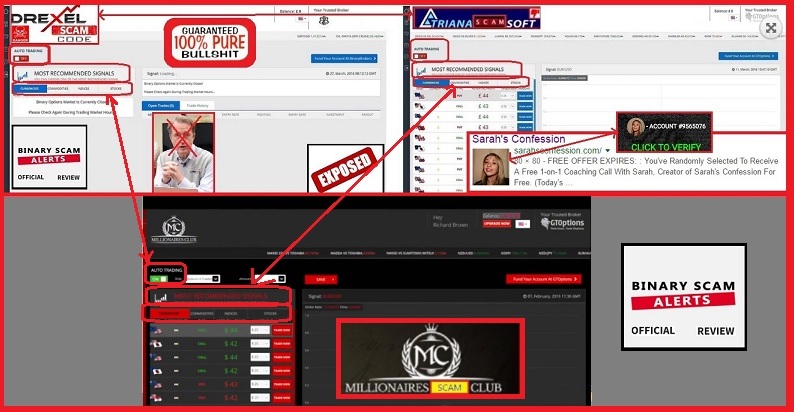 The Millionaires Club Software, App, and Autotrader, and the so called “Richard Brown” are a binary options investment scam designed to illegally solicit money and victimize innocent day traders wanting to profit from trading. It is extremely misleading, deceptive, and even dangerous. I can’t see how this can be reviewed positively, since its an obvious fake and there is nothing genuine, honest, or sincere about it besides the intent of the people behind it to steal your money and share the profits with shady offshore brokers. If you have fallen prey to this fraudulent system, please contact us and we shall do our utmost to assist you in retrieving your stolen funds. Don’t forget to join our Facebook group and Subscribe to our YouTube Channel.